It’s a new era for Dan Slott’s Spider-Man! The web-slinger has gone global! Parker Industries is more successful than ever, with offices in New York, Shanghai, London, and San Francisco, and Peter Parker is racking up the frequent flyer miles with his ‘bodyguard’ Spider-Man in tow, of course. Join writer Dan Slott and artist Giuseppe Camuncoli as they take Spider-Man to the next level in Amazing Spider-Man #1 from Marvel Comics! 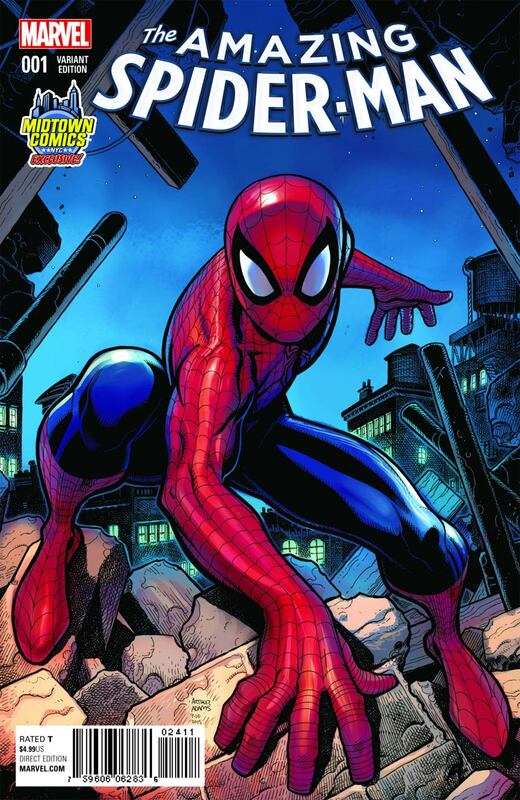 Amazing Spider-Man #1 goes on sale 10/7/2015. Get ready for a brand new approach to Iron Man! 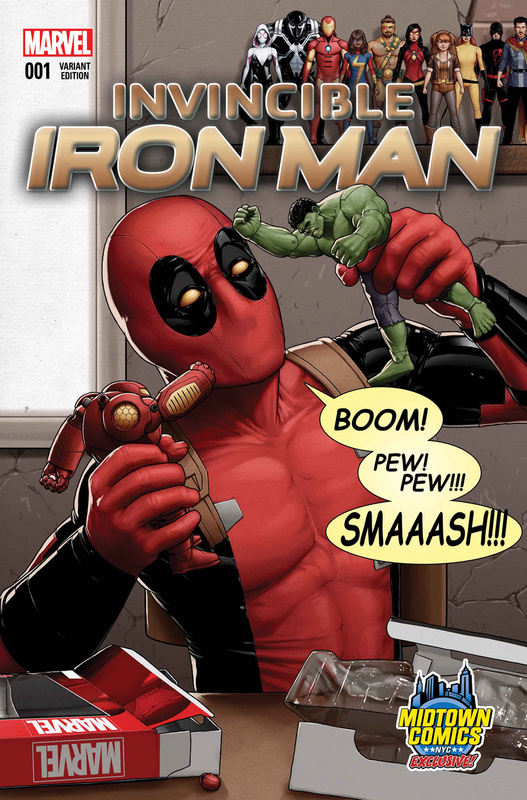 Exploding out of the pages of Secret Wars, ol’ Shellhead gets a gigantic new series with Invincible Iron Man from Marvel Comics! Look for new armor, new supporting cast, new villains and more, written by Brian Michael Bendis, with art by David Marquez! 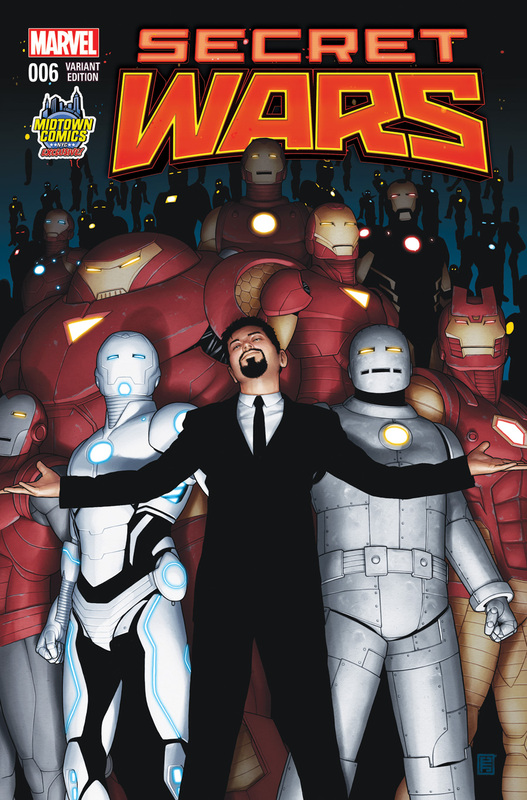 The debut issue of Iron Man’s new series will be available on 10/7/15. The Sorcerer Supreme is stepping into the spotlight! Who do you call when things are coming out of your dreams and trying to kill you? Or when your daughter is cursing in Latin and walking like a spider? Or when your dog keeps screaming at you to strangle your neighbors? Doctor Strange, of course! 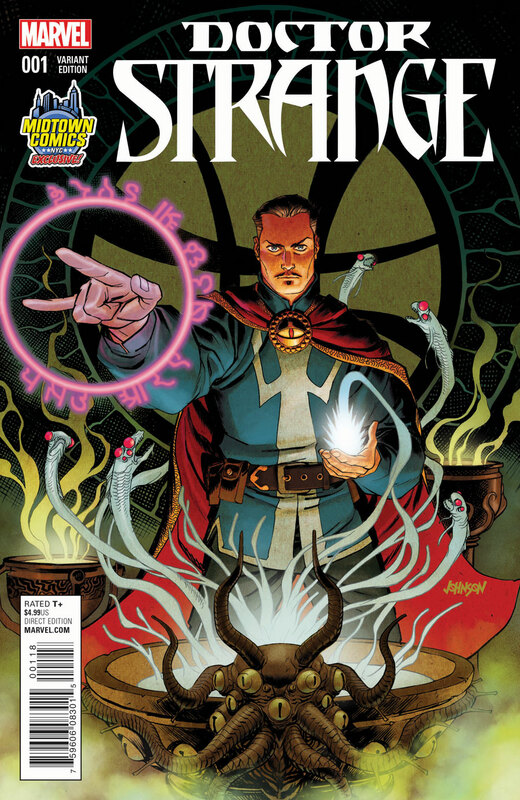 Writer Jason Aaron and artist Chris Bachalo are going to put Stephen Strange through hell in Doctor Strange #1 from Marvel Comics! The issue’s release date is 10/7/15. Prepare yourself for another chapter of Marvel’s latest epic big event! The not-so-secret war rages on in Secret Wars #6, by Jonathan Hickman, with art by Esad Ribic, cover by Alex Ross, from Marvel Comics! The issue is available 10/07/15! Who knew being grumpy could be so adorable? 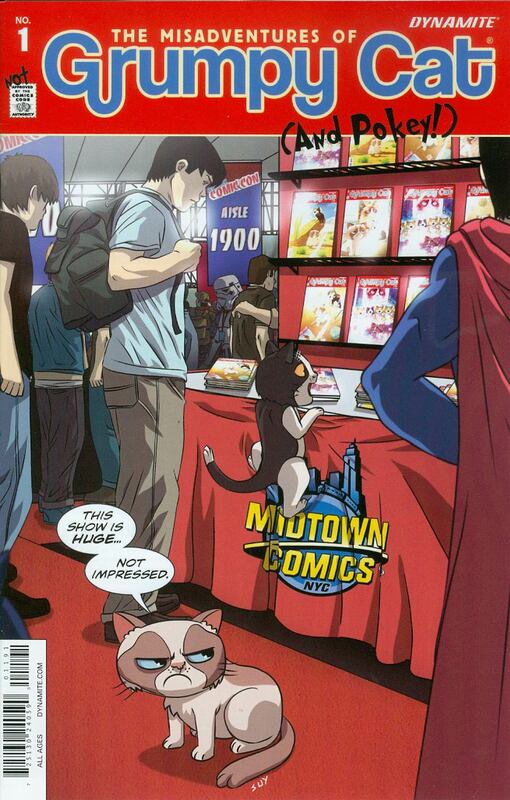 Dynamite Entertainment proudly presents The Misadventures of Grumpy Cat #1, featuring ‘The World’s Grumpiest Cat’ and her brother, Pokey, by Ben McCool with art by Steve Uy! On sale 10/7/15. A new limited series from BOOM! Studios that’s about a murder mystery in an imaginative setting? Yes, please! 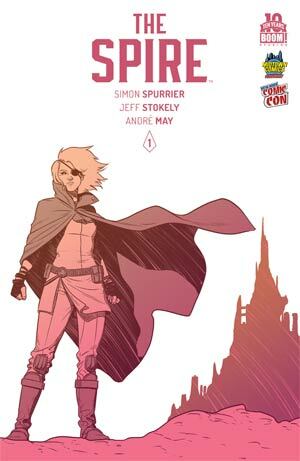 Written by Simon Spurrier and with art by Jeff Stokley, Spire #1 goes on sale 10/31/15. 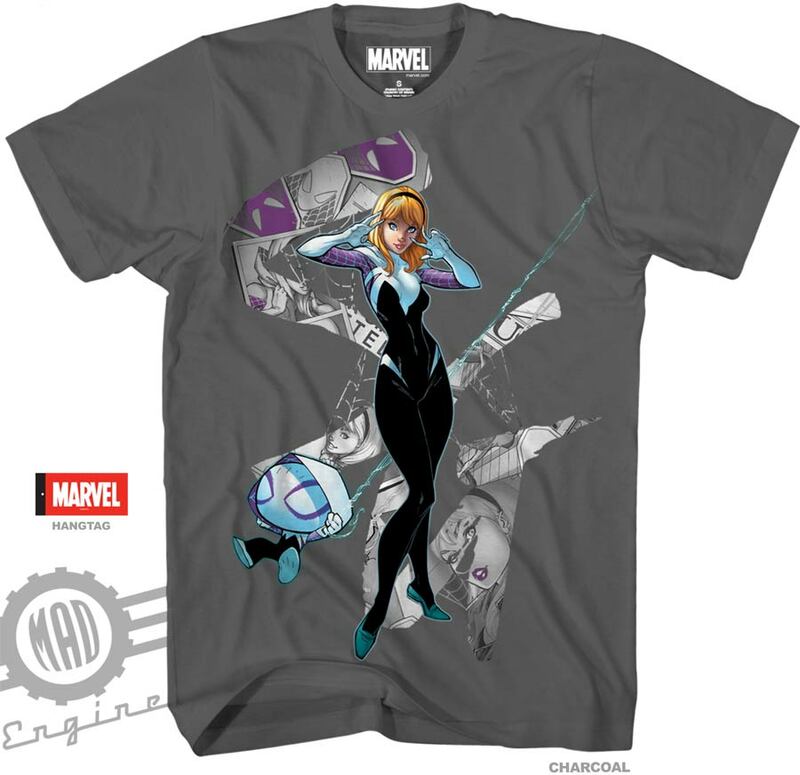 Spider-Gwen has swung right into our hearts, and now we can wear her on our shirts! From Mad Engine, torn from the pages of Midtown Comics’ exclusive Spider-Gwen #1 cover by J. Scott Campbel from Marvel Comics! This exclusive (and oh-so-awesome) shirt is available on 9/30/2015. There are no strings on this shirt; only an awesome image of an awesome villain! What do you do if your creator is an egomaniac? Do him one better, become a megalomaniac, take over the world, and wear this t-shirt! 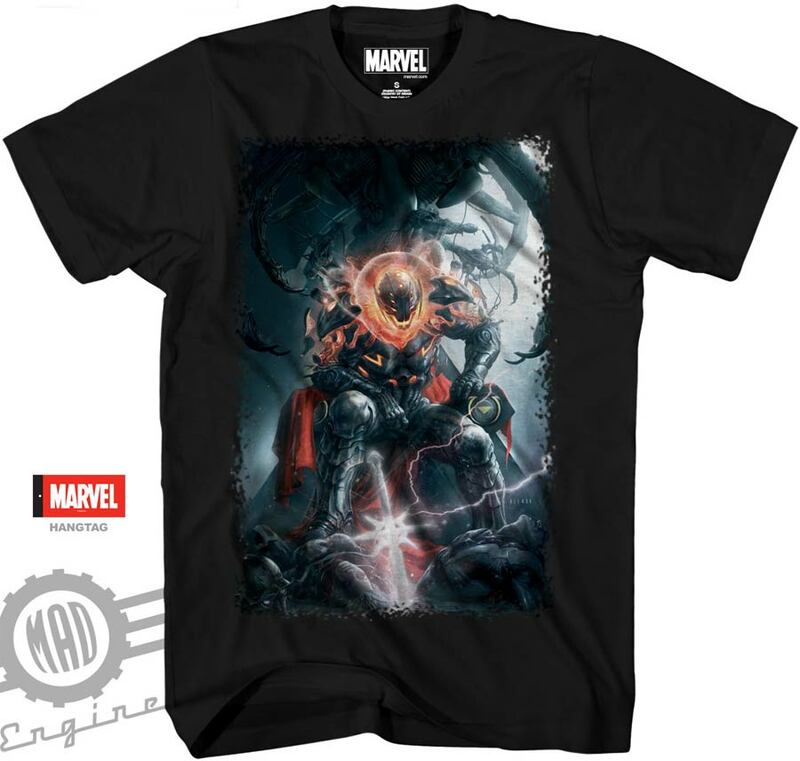 Our Midtown exclusive Avengers Ultron t-shirt is from Mad Engine, featuring art by Aleksi Briclot! This villainous shirt goes on sale on 9/30/15. From New Era comes three officially licensed Batman V Superman: Dawn of Justice 9FIFTY© Snapbacks, featuring character logos and colors inspired directly from the movie based on the iconic characters from DC Comics! 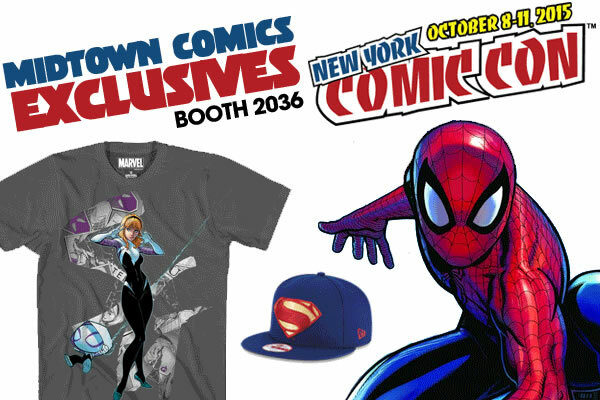 These custom “New York 2015” caps are only available at the Midtown Comics booth during New York Comic Con in limited quantities! With Batman v Superman opening in theaters next year, Graphitti Designs is unleashing four t-shirts just for fans of the upcoming DC comic book movie! Are you on team Batman, Superman, or Wonder Woman? Or maybe you can’t decide and want to pick ’em all up? Additionally, they’re releasing one shirt which features the movie’s awesome logo: a combination of Batman and Superman’s logo.